Written by William on September 11, 2011 and posted in Uncategorized. This years Fall update boasts a new user interface, much better Kinnect integration, a host of new content providers and Bing to search it all. The new interface’s navigation moves things away from the channel system of the NXE (New Xbox Experience) and back slightly more towards the blades style. Navigation is on the top, you move left and right between the panes to find what your looking for. Each pane hosts a variety of individual live tiles. Each tile serves a different piece of dynamic content: for example the home pane shows the disk in the drive, latest apps, last live tv channel watched and what appear to be a large and a small advert, although the large pane in the middle is likely to be something along the lines of the last movie watched or a movie you have downloaded and yet to watch. The new interface has been built to be fully functional with either a controller or Kinect. There is no longer an NXE dash and the Kinect dash, they are now both one and the same. Kinect’s control is not limited to motion or voice but almost every action can be done with either voice or motion, including the new search! Xbox 360. Microsoft appear to be making this the look of their brand. Microsoft’s decision engine is quickly working it’s way into everyday life for some. Now it will be working it’s way into more of the everyday life of your average 360 user. Full Bing integration into the Xbox console will make searching the already (with more to come with this dash update) large choice of content from the multiple content providers a piece of cake. Simply type what you want into Bing and it will search all content available matching your keywords and allow you to scroll through it to find what your looking for, or even discover something new! Bing works with the virtual keyboard accepting input from either a controller or Kinect but the real beauty is the voice recognition. 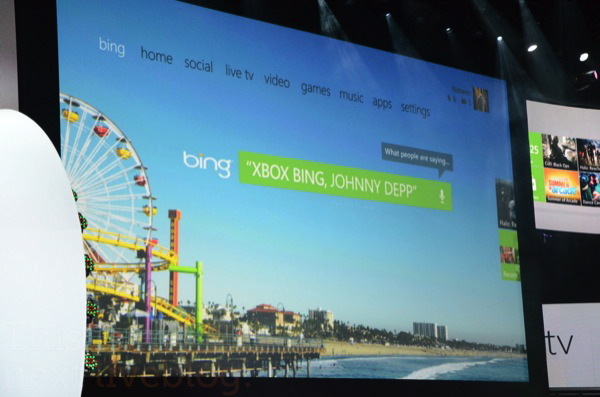 Issue the commands “Xbox, Bing, …” and it will find what you want. If it’s a game on your hard drive, in the marketplace, a film or song, and even DLC, it finds it all. From what I’ve seen so far it looks seamless and responsive. 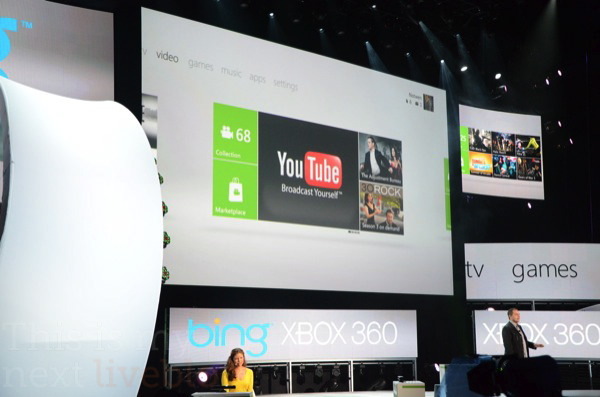 Microsoft has already partnered with some big names when it comes to video streaming. In the UK they have Sky TV, in Australia they have FoxTel and in France they have Canal +. They have now managed to strike a deal with one of the biggest names in the world to bring us content from the worlds biggest video streaming servive. That’s right: a deal has been struck with Google to bring YouTube to the console. This is something desperately wanted by some people, and will be a more than welcome addition for all the rest. This means HD video streaming right on your TV is possible! YouTube has to offer the largest collection of videos in the world. There is barely anything you can’t find on YouTube.